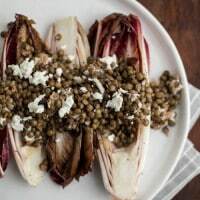 Grilled Endives with Lentils | Naturally.Grilled Endives with Lentils | Naturally. Preheat grill or grill pan. Brush each endive half with olive oil and sprinkle with salt and pepper. Grill, turning occasionally, until endive is charred and tender, 8-15 minutes depending on heat source. Remove from grill and place on a plate. Place lentils in a small stock pot and add water to cover 1-2 inches. Bring to a boil, reduce to a simmer, and cook until lentils are just tender, 20-25 minutes, adding more water as needed. Drain lentils and place in a bowl. In a separate bowl, whisk together olive oil, lemon juice, lemon zest, honey, and garlic. Pour over lentils and toss until well combined. Serve lentils over grilled endives and sprinkle with goat cheese to serve.